There are a lot of interesting things going on in director Jorge R. Gutierrez's feature film debut, The Book of Life. There are a lot of ideas, some very intriguing storytelling functions and a visual element all its own that will set the film apart from other animated fare for years to come. Still, there is both something distinctly unique to the work while never rising above mediocrity in terms of how affected or entertained I was by it. Surely, those in the Hispanic community that venture out to see this tale of their heritage come to life will get more out of it than I did, but taking it simply on the terms of being a movie it didn't entrance me like I'd hoped it would after seeing the gorgeous trailers. All of this could be due to my lack of knowledge around the history of this holiday, but however unfair it may seem the film should still reach beyond the borders of its intended audience and pull unfamiliar onlookers in. After walking out of the film, I thought to myself I didn't really have much to say about it other than it is a movie, it exists and it's fine for what it is. It says what it wants to say without getting caught up in having to conform to any typical standards that come along with being a movie for children, but that doesn't make it all the more interesting. With this seeming freedom Gutierrez takes the most liberties with the look of his film and adheres to the character design of what is clearly the dolls he grew up being familiar with. His three leads in Manolo (Diego Luna), Maria (Zoe Saldana) and Joaquin (Channing Tatum) are each charismatic and charming, but despite this being a story straight out of their cultural background it is one that still feels familiar. I didn't dislike the movie, not at all, but I didn't ever come to care about the characters as I should have given their trajectory and likely serves as the reason I feel so disconnected with the material. There is clearly a lot going on here that will entrance the eyeballs and a fair amount of musical interludes that will perk up the sometimes sullen material, but all in all The Book of Life just feels too routine to amount to anything as great or groundbreaking as it seems to be reaching for. Manolo (Diego Luna) comes from a family of bull fighters though his real passion lies in music. Beginning as a bus full of children arrives at a museum, they are taken on a secret tour by a female guide, who tells them about the famous legends and myths of Mexican folklore.The museum guide settles on a story from the titular book about the Mexican town of San Angel, and more specifically on two Gods, La Muerte (Christina Applegate) and Xibalba (Ron Perlman). La Muerte rules over the Land of the Remembered, where the spirits live on as long as their family above keeps their memory alive while Xibalba is in charge of the Land of the Forgotten, where forgotten souls decay into oblivion. During the annual Day of the Dead festival, the two Gods spot Manolo, Joaquin and Maria playing together as it is made clear the two young boys are in love with the beautiful Maria. Itching to leave the Land of the Forgotten Xibalba proposes a wager with La Muerte where if he wins they will have to switch realms. She agrees and the best it set on which of the young boys will end up marrying Maria. Manolo comes from a family of bullfighters and a father (Hector Elizondo) who is more than persistent his son will follow in his footsteps despite Manolo's real passion being music. Joaquin, on the other hand, is more adventurous and grows stronger every day with the ambition of avenging his father, a soldier who was killed by the sinister bandit Chakal. Both offer certain desirable qualities, but it is fairly clear from the beginning Maria has a certain affinity for Manolo and his guitar. After a series of unfortunate events Maria's father ships her off to boarding school leaving her suitors behind only to prepare for her return in the hopes they become the man she so desires. Over the years, Manolo is trained by his father and becomes a skilled bullfighter, while Joaquin, with the help of a magic medal given to him by Xibalba, manages to conquer many enemies and become the town hero. It is upon Maria's return that the wager intensifies and forces Xibalba to take rather extreme measures ultimately forcing Manolo into an exploration of the lands of the remembered and forgotten that he didn't see coming. While I don't feel overly compelled to continue discussing the film as I feel more content about the final product than anything else it is worth noting that The Book of Life deals with themes not always present in your child's entertainment. There are plenty of standard lessons to be learned here about being your own person or appreciating your family and heritage, but more than anything this is a movie based around the Day of the Dead and a film about death. I knew very little about what the actual plot of the film was or how much the celebration would serve as basis for the events, but these characters deal with death in a way where it isn't cause for depression, but still acknowledges the loss. There is the unfortunate side of not being able to see those we love and miss on a regular basis, but more than anything the film offers a point of view on life's greatest tragedy that turns it into a celebration; a celebration more for the sake of remembrance and legacy than that of short assimilated bonds before dispersing to not see one another again until the next holiday. Within the film the likelihood of death and the pain that comes along with it is widely accepted because the confidence in the existence of these other worlds is unwavering. There is no contemplating, no debating the existence of these Gods or their roles in life and the after life and in that it creates a sense of wonderment and of intrigue by the young, impressionable minds in the audience. This type of approach is not only one you can translate into different systems of belief, but it no doubt offers reassurance in feeling more at peace and having a better understanding when it comes to discovering the ramifications of actually losing someone. It is not an easy thing to talk to a child about death, but to propose a film intended for children based around the idea takes even more courage (both by director and the studio willing to roll that dice) and while I ultimately didn't find the final film as impactful as I'd hoped it is certainly admirable that it was willing to go to these lengths. Maria (Zoe Saldana) listens to Manolo serenade her from her balcony. Growing up, I was never keen to the idea of stop-motion or claymation, but found it rather odd and off-putting. I was never able to appreciate what people found so intriguing about The Nightmare Before Christmas and not until 2012's ParaNorman did I really begin to see why it could be so effective. I remember enjoying Chicken Run and Monster House for their outwardly comic value, but here the inspiring animation is all the more prevalent as it employs its technique (CG modeled after stop motion) to emphasize the tone. 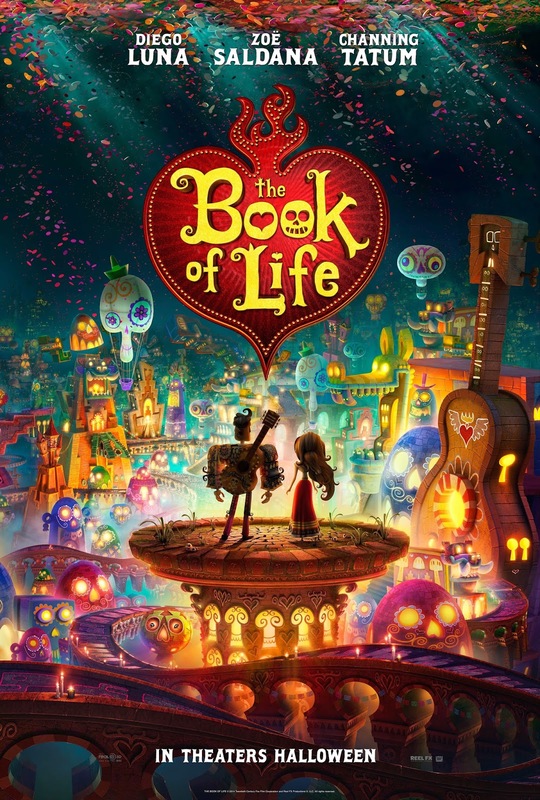 It is for this and the boldness of the themes that The Book Of Life is worth checking out, but further than this I can't find anything to invest in as far as character development or how conventional the actual story being told ends up rather than running with the freedom it clearly has. It also feels obligatory that I mention that the voice cast seems to at least be having fun. Tatum plays what he has perfected by this point as the dumb jock in the Jump Street movies while Diego Luna, like director Gutierrez, seems so close to the source material that he has invested all he can in it. Saldana is pleasant as the object of everyones affection while operating in a situation that naturally reduces her to little more than an object. Gutierrez and his co-screenwriter Douglas Langdale are sure to give Maria a multi-faceted skillset and independent mentality after she returns from boarding school that allows Saldana to spice things up. Overall though, if I were to think about The Book of Life in the future I would actually relate it back to something like Aladdin where the young heroes of the story are almost forced into being something they're not to win the affection of a beautiful girl despite the girl only wanting true, raw emotion and not manufactured attributes from which you draw bragging rights. That and Ice Cube shows up in what is essentially the role of the Genie.